Last night I was reading “A Popular Account of Ancient Musical Instruments and Their Development: As Illustrated by Typical Examples in the Galpin Collection at Hatfield, Broad Oak, Essex” By William Lynd. Yes, I have a fascinating life. This book was published by J. Clarke in 1897. 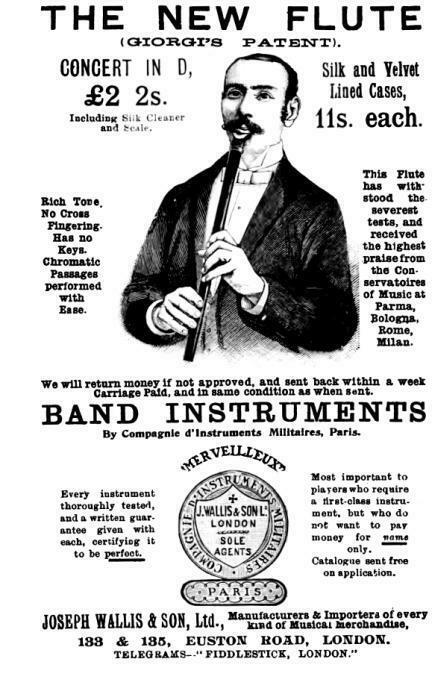 I do not know if J. Clarke was any relation to the founder of the Clarke Tinwhistle Company. The embouchure the player is using in the illustration is a bit unclear. I also question whether the artist accurately portrayed the mouthpiece. This may have been an end-blown flute like a kaval or ney but it also might have had a fipple mouthpiece like a whistle. Either way it is an interesting instrument. Has anyone ever seen one of these? Well, this is the most similar flûte occidental (it seams on the stamps, made in France?) like a quena, it’s really interessing. It’s aparently fanfare or military band’s instrument. Be always sincere, and be yourself. Be true! Have no axe to grind, go always straight for the goal and be strong.